April 1, 2015 April 2, 2015 1 Comment on An Epidemic in Madness? Contagious diseases are usually understood as physical illnesses, but the rather less orthodox idea of infectious mental diseases is worth considering. Historically, public health officials, immigration officers and well-meaning social reformers harnessed the language of madness, mental deficiency and mental illness to galvanize a popular response against the threats posed by such afflicted individuals to the larger body politic. Early 20th century reformers lobbied governments to stem the tide of feeblemindedness, arm themselves against the hereditary toxins evident in families ‘soaked’ with deficiency, or to segregate people whose feeblemindedness polluted an otherwise wholesome stock of superior humans. The language of mental disease and degeneration sat comfortably with the moralizing tones of public health officials who were keen to sanitize their communities by keeping mental illness out, through immigration restrictions, or marriage regulations, and some went further to treat this infectious possibility through institutionalization and even more overt eugenic measures such as sexual sterilization. Although we might now balk at the unsophisticated collusion of moral reform and the most basic science of heredity of the early 20th century, the spectre of madness as a contagious phenomenon has continued to evolve into a modern menace. In what many scholars have increasingly, and critically, considered an insidious relationship between psychiatry, neuroscientific research, and the multi-billion dollar pharmaceutical industry, madness remains unconquered, and indeed on the rise. Even if we are unsettled by the notion of a biological or viral infection spreading schizophrenia, for example, might we accept that the heavy political and cultural investment in mental health produces at worst a Mobius strip? The more diagnostic classification manuals, the more sub-categories of madness; the more institutions, the more patients; the more psychopharmaceuticals, the more consumers; the more we understand the brain, the more we realize we don’t know. Madness continues to proliferate, spread, and multiply. This phenomenon is not localized. It is not confined to the Western world nor to any singular line of psychiatric thought. Psychopharmaceutical ads from across the globe reveal some of the unspoken communications that take place between health consumers, health care providers, and psychopharmaceutical marketers. Across the so-called developing and developed worlds, the domains of capitalism and state socialism, tightly regulated jurisdictions and bastions of the free-market, advertisements elucidate the latent fears of contamination that underlie psychiatric disorders. Contagion is not necessarily confined to bodies, just as the fears of ‘catching’ mental disorders feed on filaments of abstraction. Advertisers amplify features of everyday life, transforming recognizable situations into pathological conditions: anxiety produced by urban spaces; families that are torn apart by disorganized behaviours; or, individuals who are ostracized because they are disconnected from social norms. The fear of succumbing to any one of these scenarios furnishes marketing campaigns, playing upon assumptions concerning the delicate balance between mental health and mental illness alongside the often invisible but destructive consequences. The fast and loose use of tropes in advertising seize upon fears of contagion that continue to plague our social understanding of mental disorders. More cynically, the multi-billion dollar investment in psychopharmaceutical production/consumption creates these inherent cultural dispositions by fuelling the concept of contagion with vivid imagery. Ads that massage the scientific evidence and rely on more familiar, even celebratory, images of people restored to complacency [health] by joining the new normal, the new madness, or a universal way of being [normal]; a way of being that is inseparably infected by modernity itself, and thus always on the edge of unreason. Globally speaking, several themes of contagion permeate psychopharmaceutical advertising. Mentally ill individuals, through the advertising lens, threaten the emotional, psychological, and even physical well-being of the people around them. Examples of advertisements from Australia (the anti-convulsant Tegretol), France and the United States (alcoholism medications such as Curethyl and disulfiram), and South Africa (the anti-depressant Talomil) all frame mental illness as a social threat, endangering people in the individual’s immediate environment, and by extension the rest of society. In short, individuals diagnosed with mental illness threatened the possibility of a stable and orderly life. Further focusing on the individual over the environment, pharmaceutical remedies are then available to solve the problem. The family was a particular site of concern over contagion. Although depictions of individual suffering gave way to smiles towards the end of the twentieth century, the danger posed by mental illness remained front and centre. In a series of micro-narratives, individuals considered mentally deficient were able to return to their families only after the threat of contagion had passed. 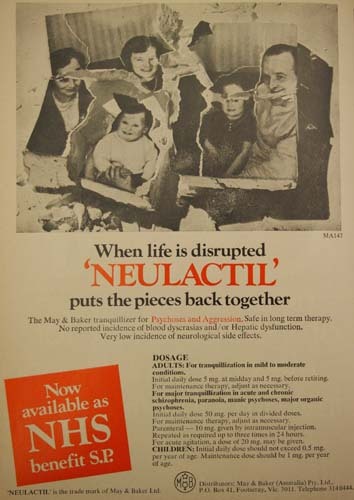 In ads for drugs such as Risperdal (Saudi Arabia), Seranace and Neulactil (both New Zealand), Lyndiol (South Africa) and Dexipol (UK), the observer sees post-treatment individuals whose family lives have been (sometimes literally) patched up through the miracle of medication. With their aberrant behaviours neutralized, these individuals are free to rejoin their parents, siblings, and children. Such advertisements make it clear that the mentally well and ill should not mix, at least until the danger posed by the patient had subsided. In later years, advertising trends blurred the line between mentally ill and mentally healthy individuals. Instead, advertisers were keen to demonstrate that mental illness could befall anyone. New patient tropes – overworked executives and lonely geriatrics (many of these stereotypes had been absent in the early years of psychopharmaceutical advertising) – testified to the fact that mental illness was now affecting anyone and everyone. Thai ads for the anti-depressant Tofranil and the anxiolytic Xanax both hammer this point home by depicting individuals from all walks of life as having been felled by mental illness. Campaigns by the marketers for Paxil (South Africa) and Prozac (UK), meanwhile, opted to depersonalize sufferers, relying on snapshots of feet and hands to underscore the message that the rushing tide of mental illness does not discriminate. Marketers seized upon these cultural tropes in direct ways. The French Laboratoires Diamant boldly named their anti-anxiety medication Urbanyl. The ad features modern accouterments of time-space compression, highlighting sketches of telephones, mechanized agriculture, vehicular traffic, an airplane, and the drooping figure of a flower situated beneath the fast-leaping torso-less business man, poised to conquer this urban jungle. 1950s advertisements for the minor tranquilizer Miltown tried to count the cost of living, stressing that a wave of neurotic anxiety was “the price exacted by the tempo of today.” South African marketing for Anatensol, meanwhile, utilized a puppet orchestra to highlight the range of disorders brought about by “the tempo of today” and the “pitch of modern life.” Yugoslav ads for Apaurin eschew such direct messages, instead relying upon thick-lined imagery more reminiscent of Diego Rivera’s political critiques of man’s place in the industrial world, one dwarfed by machines and technology. What drives this epidemic? In spite of claims to the contrary, the arrival of modernity has repeatedly emerged as the common culprit. If mental illness can be conceived as a contagious virus, the modern world provides the perfect breeding ground. Mat Savelli is a Post-Doctoral Fellow in the Department of Health, Aging & Society at McMaster University. He completed his PhD at Oxford University in 2011. Erika Dyck is a Canada Research Chair in the History of Medicine at the University of Saskatchewan. She is the author of Psychedelic Psychiatry: LSD on the Canadian Prairies. She is a co-editor of this special series of ActiveHistory.ca posts.